Is there a two-horse race to be the top pick in June? For the first time over the course of the draft year, I’m going to say yes. The rest of the media will certainly play it up as such — expect that narrative to emerge during next week’s draft lottery — but scouts are starting to suggest the same. Jack Hughes, an American centre, has been the wire-to-wire favourite to go first overall and he’s lived up to that hype by rewriting the NTDP record books this season. However, his challenger, Finnish forward Kaapo Kakko, has been on fire since scoring the golden goal at the World Juniors and he was electric in the Liiga playoffs despite losing out. Kakko has forced his way into the No. 1 conversation, making it a 1A-1B scenario and ensuring that there is no losing in selecting second this year. This race, as of today, is closer than 2016 when Auston Matthews held off a surging Patrik Laine. As for who goes first in 2019, that could be decided in another head-to-head showdown later this month at the under-18 world championship, April 18-28 in Sweden. 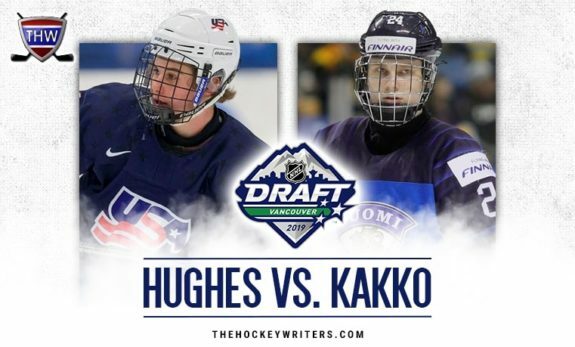 There is a chance that one or both of Kakko and Hughes will also be on display at the men’s world championship tournament, perhaps forgoing the U18 showcase. That remains to be seen, but they are now together in that top tier for me. I’m big on tiers and the breakdown for my April rankings is as follows: 1-2, 3-4, 5-12, 13-29 and 30-41 in terms of first-round candidates. One name that remains higher in my rankings than most is Philip Broberg, who reminds me of Oliver Ekman-Larsson with his size and elite skating. 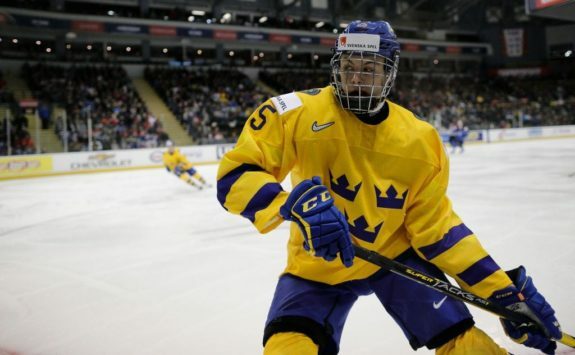 Providing his offensive game continues to develop, Broberg could also draw favourable comparisons to John Klingberg by the time he enters the NHL. Broberg has been a stud for Sweden on the international stage and I expect him to make another big statement — another case for being a top-five pick — on home ice at the U18s. I still have Broberg in that 5-12 tier, at No. 5 as the second-best defenceman in this year’s draft class behind Bowen Byram (No. 4), but most my scouting peers have dropped Broberg out of their top 10 and into the teens or even the twenties. We shall see how he fares in this final on-ice showcase, with my May ranking to be somewhat reflective of that performance. Philip Broberg represented Sweden at the World Juniors, with some standout moments, after being a dominant force for his country at the Hlinka Gretzky Cup back in August. Broberg is just one of several prospects that I’ll be watching closely at the U18s, while also keeping tabs on all the playoffs in various leagues around the world. NOTE: Listed by position in alphabetical order. NOTE: I believe these 1998-born prospects are no longer eligible, but in case I’m wrong they would warrant draft consideration.